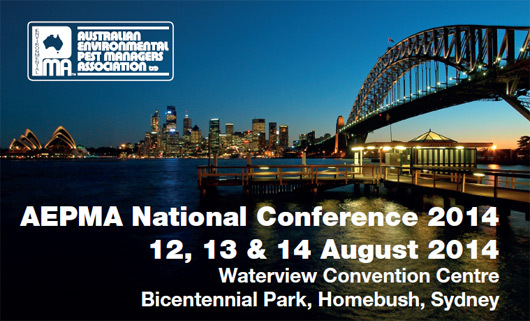 It is with great pleasure and excitement that the National Board of AEPMA announce that the national conference will be held on 12-14 August 2014 at the Waterview Convention Centre in Sydney. The program for the conference has been developed based on member feedback and is a comprehensive and informative expose of the industry in its current form and for the future. The two day program has once again been tailored to suit all attendees. The first day is titled "What's new....and emerging in Pest Control - What every business needs to know". This will be of particular interest to all business owners and managers to make sure that their individual business remains relevant in a very competitive market. Day two will be a two-stream day and attendees will be able to choose which stream they attend. It is titled "The ABC of Practical Pest Control - How to Save Time and Make Money". This will be a necessity for every person involved in the pest industry from owners and managers to technicians, because without efficiency and effectiveness in our businesses we will not survive - it's a must attend. For the first time at the National Conference, there will be a pre-conference function, a cocktail Harbour Cruise on 12th August, taking in the sights of beautiful Sydney Harbour. This is a strictly limited numbers event - free to the first 150 registered delegates. Another highlighted event at the conference is the "Pest Manager of the Year Awards" presentation dinner on 13th August. The Waterview Convention Centre, located in Bicentennial Park, next to the Olympic complex in Homebush, has once again been chosen to host our conference with its central location, ease of travel, parking and the proximity to outstanding hotel accommodation. Once again, the program is exciting and full of outstanding and interesting presenters with the very latest in industry topics, plus some 20+ exhibitors displaying the very latest in the industry. We look forward to seeing you in Sydney in August.